Approximately the same size as the United States of America and claiming The World’s Largest Population, China is such an an immense, diverse, and fast-changing country that planning a visit there can be an incredibly daunting task – especially if you’re short on time. So I’ve put together this little three-week itinerary in order to make the job a little easier for you. 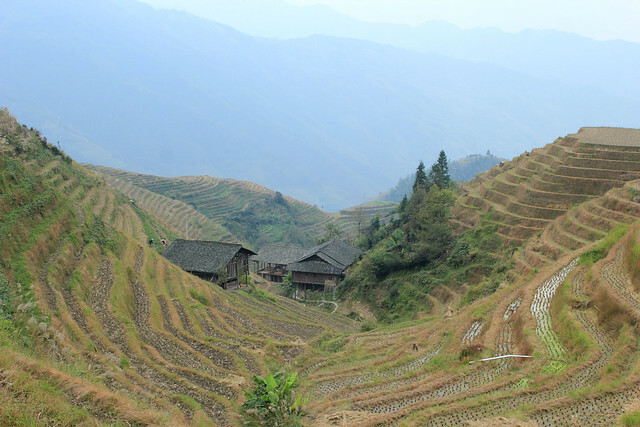 From the sprawling metropolises of Beijing and Shanghai to the Karst mountain scenery of Yangshuo, and the fertile rice terraces and minority tribes of Longji, this busy, but very manageable (I speak from first-hand experience!) China itinerary will give you a good introduction to one of the world’s most fascinating countries. Aim to arrive into Beijing fairly early on the first day, in order maximise your sightseeing time. If you’re anything like me though and unable to sleep on flights, you’ll probably spend the entire first day wandering around in some bleary-eyed kind of culture shock. Beijing is a huge city and even if you’re familiar with South-east Asian cities like Bangkok, Phnom Penh and Ho Chi Minh City, it can still be an incredibly overwhelming place to navigate your way around. This was one of my favourite spots in the city. 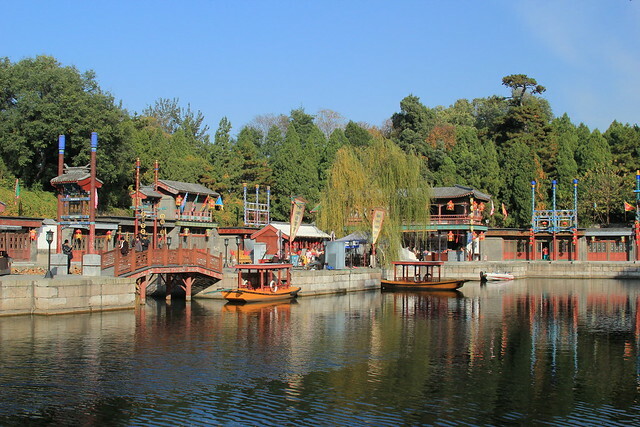 Situated in the Haidian district, the Summer Palace is 15 kilometres north-west of central Beijing, although it feels like a world away from the overwhelming cacophony of the city’s chaotic streets. Scattered with temples, covered walkways, pavilions and bridges, the palace and its gardens occupy an area of almost 750 acres altogether. The most renowned Tibetan Buddhist temple outside of Tibet and still used as an active place of worship, Longshe is a beautiful, serene place to spend an hour or so, yet just minutes from one of Beijing’s busy central tube stations. Otherwise known as a type of narrow street or alley, formed by lines of traditional courtyard residences known as siheyuan, hutongs are predominantly associated with Beijing. 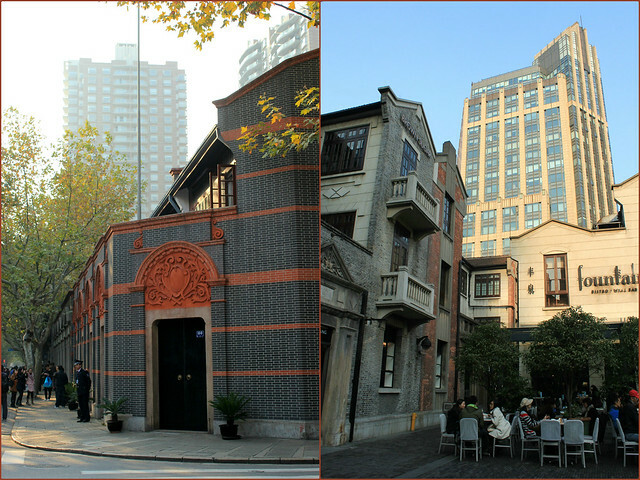 The oldest hutong in the city, Sanmiao Street, dates back over 900 years. Contrary to popular belief, the Great Wall is not a single, continuous wall, but rather a series of fortifications built by various dynasties to protect China’s northern boundary, that have since been joined together. 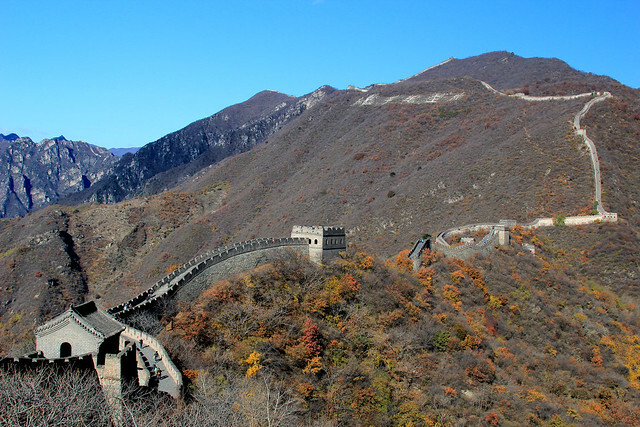 We visited the Mutianyu section of the wall, on a beautifully crisp, sunny autumnal morning. It was surprisingly quiet, and the views totally blew me away. Catch an overnight train to Xi’an on your second full day in Beijing and then base yourself in the city for two nights in order to experience the following sites. Over 1000 years ago Xi’an was the starting point of the famous Silk Road, and as a result merchants overseas students from Arabic countries and Persia used to travel to Xi’an for business, and began to settle in the area. There’s a fascinating market here, located on Xi’an’s Huimin Street. 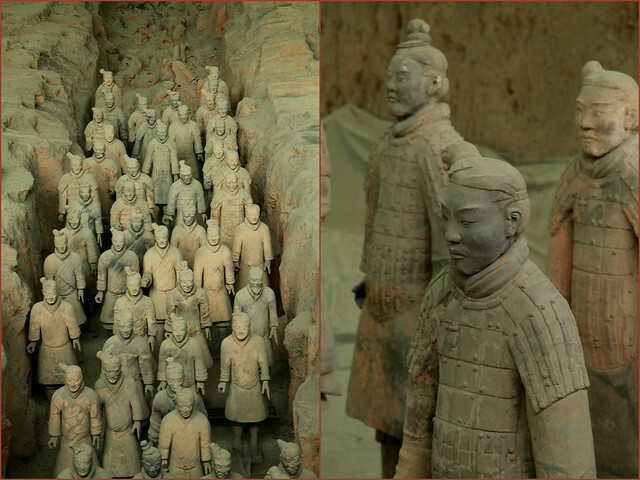 Considered one of the greatest archaeological discoveries of the last century, there are literally thousands of lifesize warriors guarding the tomb of the first emperor of a unified China. What I didn’t realise before arriving was just how much of a work in progress this massive discovery still is. Catch a train from Xi’an to Yichang from where you can board the boat to begin your cruise down the Yangtse to Chongging. Surrounded by hazy mountain peaks, this mystical section of the Yangtse has inspired traditional Chinese painters for many years. 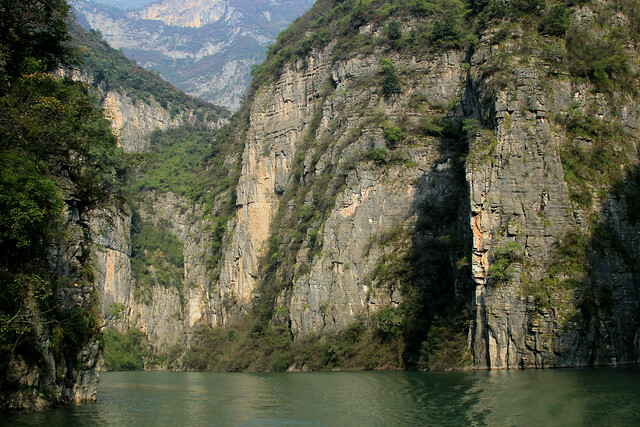 You’ll pass the famous Three Gorges, and there are ample opportunities to disembark and explore a few of the river’s smaller tributaries by boat. From Chongging, it’s possible to catch a train to Chengdu, to arrive in the city around mid-afternoon. 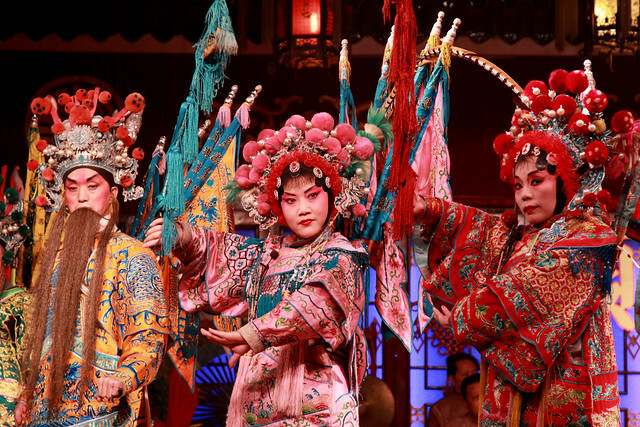 Chengdu is famous for its spicy Sichuan cuisine, its tea drinking culture, and its opera. Located directly next to Wuhou Temple, Chengdu’s 350-metre long pedestrianised market street is best visited after dark when the area really comes to life, beautifully decorated with hanging lanterns and fairy lights. Mingle amidst locals and tourists alike as they browse porcelain and folk handicrafts, and locally-produced clothing and art work. There are also plenty of tea shops and eating establishments to tempt you in. Towards the end of Jinli Street there’s a traditional tea house that showcases daily performances of Sichuan Opera. I won’t say too much but this isn’t opera as we know it in the UK; it’s one of the most beguiling performances I’ve ever seen in a foreign country and the changing of the masks will leave you completely dumbfounded. 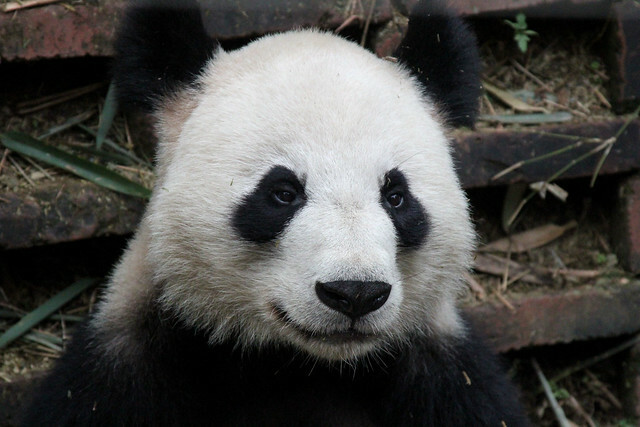 Even if you weren’t a fan of pandas beforehand, I guarantee you will be after a visit here. The centre is a non-profit research and breeding facility for giant pandas, and you’ll be able to see many of them (from pups to fully-grown adults) roaming around in their leafy enclosures. If you time your visit right you’ll be able to see some new-born pandas in the nursery, too. Catch an overnight sleeper train to Sanjiang, and join a tour to a few of the minority villages. For the first night we stayed at the Dong minority village, Ma An Zhai along the Hunan-Guizhou-Guangxi borders. The scenery here is nothing short of amazing and I was grateful for the long hikes through landscapes far from civilisation. The village of Dazhai, where we stayed overnight, is made up of some 60 Yao families, who live here amongst a network of stunning rice terraces. Whilst there were some incredible views from the window of our guesthouse, don’t miss the opportunity to take a stroll around the village itself. Another long and beautiful hike will bring you to the Zhuang minority village of Pingan. 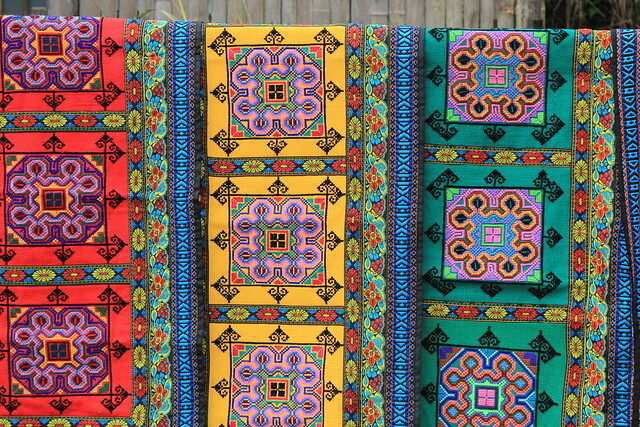 Skilled in weaving and embroidery the Zhuang have received worldwide recognition for their exquisite designs of cotton woven brocades. If you don’t have room in your backpack to take home one of these beautiful pieces of artwork, make sure you get a photo. Nestled beside the banks of the Li River and set beneath a backdrop of towering karst mountains, the market town of Yangshuo has an established tourist infrastructure that makes it easy for you to make the most of your time there. 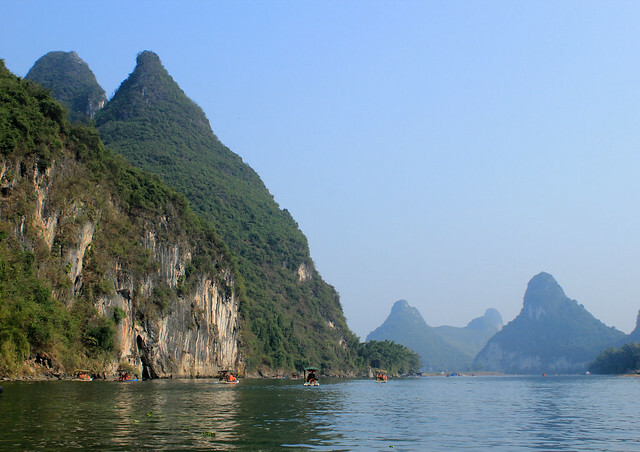 You can shop for some beautiful reasonably-priced souvenirs, eat (and learn to cook) some quality Chinese cuisine, explore the surrounding countryside by bicycle, and take a boat trip along the Li River. At night time you can even watch the famous cormorant fishermen at work. Take a bus to Guilin in time to catch the overnight sleeper train to Shanghai. 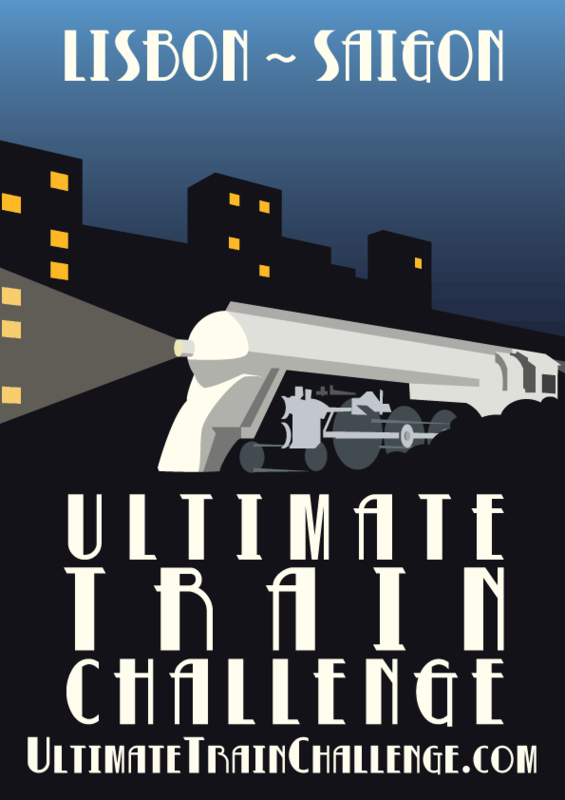 This is the longest train journey of the trip – a whopping 22 hours – but the beds are comfy and if you’ve got good company and a deck of cards, then the time passes quicker than you’d think! Shanghai is a modern, cosmopolitan city that’s a lot more Westernised than Beijing. Stroll along The Bund and admire its majestic colonial buildings and tall neon-lit skyscrapers, wander through the tree-lined avenues of the French Concession, visit the Yu Yuan gardens in the centre of the Old City and absolutely do NOT miss the incredible Shanghai Acrobats. 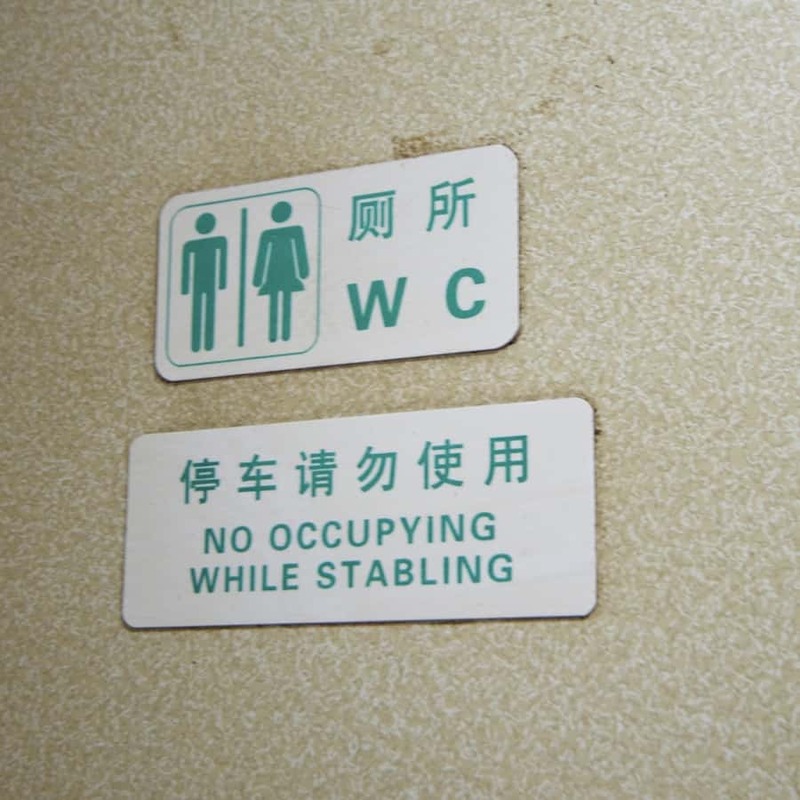 Have you visited China before? What do you think of my itinerary? Anything you would change/add/remove? Hi I'm Kiara, the Travel Blogger, Photographer, Storyteller & Adventuress behind Gallop Around The Globe. I can usually be found hiking up mountains, getting lost in the cobblestone streets of my favourite cities, making friends with a furry feline or two, photographing cacti, or grazing on olives and cheese. amazing details about the place! if you are planning for a honeymoon in Mauritius? Proyatra 011 47177000 provides cheapest honeymoon packages for mauritius.